NEW YORK -- Jay-Z is the leader of the 2018 Grammy Award nominations in a year where the top four categories are heavily dominated by rap and R&B artists, giving the often overlooked genres a strong chance of winning big. The Recording Academy announced Tuesday that Jay-Z is nominated for eight honors, including album, song, and record of the year. Bruno Mars is also nominated for the big three, while Kendrick Lamar - who earned seven nominations - and Childish Gambino are also up for major awards. Jay-Z's personal and revealing album, "4:44," is nominated for album of the year alongside Mars' 90s-inspired R&B adventure "24K Magic," Lamar's hard-hitting rap masterpiece "DAMN.," Gambino's funk-soul project "Awaken My Love!" and Lorde's critically acclaimed pop album, "Melodrama." Record of the year nominees include Jay-Z's "The Story of O.J.," a song about blackness and managing money that also references O.J. Simpson; Mars' Top 5 hit, "24K Magic"; Lamar's No. 1 smash, "Humble"; Gambino's "Redbone," which peaked at No. 12 on the Hot 100; and the year's biggest hit, "Despacito," by Luis Fonsi, Daddy Yankee and Justin Bieber. "Despacito" is also nominated for song of the year - a songwriter's award - along with Mars' No. 1 hit, "That's What I Like"; the title track from Jay-Z's "4:44"; rapper Logic's suicide prevention anthem, "1-800-273-8255"; and "Issues" by Julia Michaels, the singer who has written hits for Bieber, Selena Gomez and other pop stars. Michaels is also nominated for best new artist, where R&B and rap rule again: Her competition includes singers SZA, Khalid and Alessia Cara, as well as rapper Lil Uzi Vert. No rock or country acts were nominated in the top four categories. The rap- and R&B-heavy nominations, which include numerous black and Latino artists, come after the Grammys were criticized earlier this year when some felt Beyonce's multi-genre "Lemonade" album should have won album of the year over Adele's "25." Adele also expressed that Beyonce should have received the prize. The win for Adele, though, marked another year when the Grammys awarded its biggest prizes to an artist outside of the rap or R&B genre. Kanye West, Eminem, Mariah Carey and others have also lost in the top categories over the years to pop, rock and country acts despite owning the year in music, critically and commercially. "We have a current membership that is savvy and certainly timely, is current, and reflective of what music is about today and in the future. And clearly the diversification work that we've done for our membership is evident in all of the nominations this year," Neil Portnow, the academy's president and CEO, said in an interview. "I think it's a testimony to our hard work and intention of having a very vibrant, current, relevant, diverse voting membership." Jay-Z or Lamar could make history next year when the Grammys take place in New York City on Jan. 28, 2018: Either album could become only the third rap-based album to win album of the year; and either song could become the first in the rap genre to win record or song of the year. 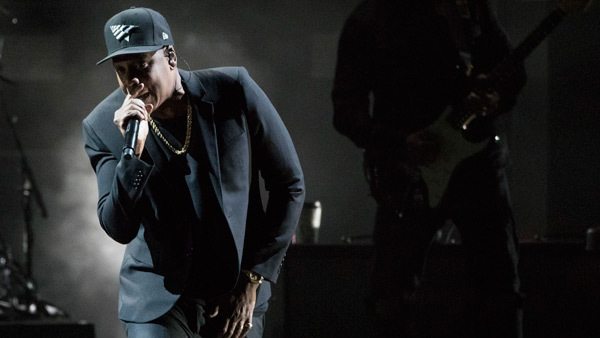 "4:44," which includes songs about Jay-Z's relationship with Beyonce and family life, marks the rap icon's first nomination for album of the year as a lead artist; it is Lamar's third in the top category. Lamar will compete with Jay-Z in all seven categories he is nominated in, including best rap album, best rap song, best rap performance, best rap sung performance and best music video. Mars is behind Jay-Z and Lamar with six nominations, including best R&B album, best R&B song and best R&B performance. Gambino, better known as Emmy- and Golden Globe-winning actor Donald Glover, scored five nominations. Others who earned five nominations include SZA, Khalid and No I.D., who produced Jay-Z's album and is up for non-classical producer of the year. Ed Sheeran, who has the second best-selling album of the year with "Divide," was snubbed in the top categories. "Divide" earned a nomination for best pop vocal album, while his No. 1 hit, "Shape of You," is up for best pop solo performance. Nominees for best pop vocal album include Lady Gaga's "Joanne," Coldplay's five-song EP "Kaleidoscope," Imagine Dragons' "Evolve," Lana Del Rey's "Lust for Life" and Kesha's "Rainbow," marking her first Grammy nomination. Kesha, who has been in a legal war with former mentor and producer Dr. Luke, is also nominated for best pop solo performance for "Praying." Leonard Cohen and Chris Cornell are both nominated for best rock performance; other deceased nominees include Glen Campbell, Gregg Allman and Carrie Fisher, who is nominated for best spoken word album, where Bernie Sanders, Mark Ruffalo and Bruce Springsteen are also nominated. In the country categories, Chris Stapleton leads with three nominations. Miranda Lambert, who earned two nominations, was surprisingly shut out of best country album though her double album, "The Weight of These Wings," was a critical favorite. Others who earned multiple nominations include Pharrell, Ledisi, Nothing More, Alison Krauss, Daniel Caesar and Foo Fighters. Randy Newman's song "Putin," his sardonic ode to Russian President Vladimir Putin, is nominated for best arrangement, instruments and vocals. Taylor Swift, who didn't earn nominations for her single "Look What You Made Me Do" - released before the Grammy cutoff date - did earn a nod for best country song for writing Little Big Town's No. 1 hit, "Better Man." Swift is also nominated for best song written for visual media for "I Don't Wanna Live Forever," her collaboration with Zayn from the "Fifty Shades Darker" soundtrack. Her new album, "reputation," will qualify for nominations at the 2019 Grammys. Cardi B, who had one of the year's biggest hits with "Bodak Yellow (Money Moves)," earned two nominations: best rap song and best rap performance. Another female rapper scored nominations, too: Rapsody is up for best rap song for "Sassy" and best rap album for "Laila's Wisdom." In the latter category, she will compete with Jay-Z, Lamar, Migos and Tyler, the Creator. Snubs include Future, J. Cole and DJ Khaled, who has two of the year's biggest hits with "Wild Thoughts" and "I'm the One." Albums and songs eligible in the 84 categories at the 60th annual Grammys had to be released between Oct. 1, 2016 and Sept. 30, 2017. This year is the first year the Grammys used online voting for its main awards show; it started online voting for the Latin Grammys last year.